My name is Ramakant. I am from Bihar. I got injury on my tooth while playing cricket and it had turned black. There was gap between my front teeth. My friend suggested me to go to DrAshish for braces treatment. I have got braces and a crown for front teeth. 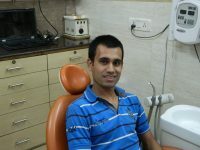 Now my treatment is complete and my teeth look better than before.